Former world triathlon champion Non Stanford has been chosen to lead Team Wales at the 2018 Commonwealth Games. The 29-year-old from Swansea will lead the team of over 200 athletes out at what is her first Commonwealth Games. Stanford narrowly missed out on a triathlon bronze medal at the Rio Olympics in 2016. "Team Captain is a big role and I'm very grateful to be given the title for Team Wales heading to the Gold Coast next month," she said. "The Commonwealth Games has been a dream of mine since a young age, it was on my radar well before the Olympic Games. "Growing up, my dream was to be able to compete for my country." Stanford missed the 2014 Commonwealth Games in Glasgow through injury as she suffered a stress fracture in her left ankle. "Missing out on the last Games in Glasgow was really tough for me so to now have the opportunity to wear the red jersey and lead a strong Team Wales out in Gold Coast- I'm just thrilled," said the former Swansea Harriers runner. Stanford also missed most of the 2017 season through injury and illness but says winning a medal for Wales would be unlike anything else. "We're so patriotic as a nation so when you get the chance to compete for Wales, it's a special moment in your career and unlike any other opportunity." The 2018 Commonwealth Games begin on 4 April on the Gold Coast, Australia. Team Wales' chef de mission, Professor Nicola Phillips, said she was "really pleased" Stanford had agreed to take on the role. "She is going to be such a fantastic ambassador for the team," Prof Phillips said. "She leads by example in her attitude and her behaviour as well as obviously having shown excellent performances over the years." Prof Phillips added she was not concerned that Stanford is yet to experience a Commonwealth Games herself. "She's somebody who is very experienced in a multi-sport Games, who's seen the highs and lows," she continued. "She will bring that experience and transfer it to a Commonwealth Games." 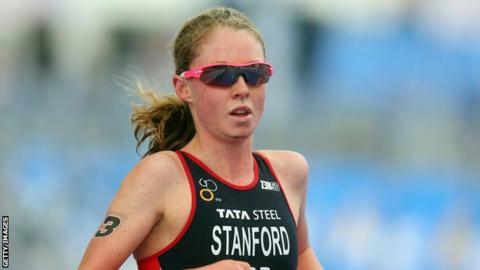 Stanford could get her country off to the perfect start as the women's triathlon is the first medal event of the Commonwealth Games on 5 April. She will also take part in the mixed relay event two days later.